Damage is visible. Especially when you have inexpensive countertops, expect to find wear and tear faster. Using material such as laminate could peel or erode. When these signs start to reveal themselves, you’ll need to replace them sooner than later. While some may consider stripping and re-laminating, it may not be worth the hassle. The material below could have been exposed to certain bacteria that cannot be removed with simple surface cleaning. Just renovating the shell of anything will only be a temporary bandage to a permanent situation. In this particular situation, it is best to completely replace the countertops for a more permanent solution. Burn marks or un-removable stains. Because countertops are specifically made for cooking and prepping, it is not a shock that countertops will get scratches, burns and stains. With cutting vegetables, fruit and other produce products, a few scratches are bound to pop up on the surface of your countertops. In addition, when cooking, hot pots might be placed on the surface. When done carelessly or more often than not, the counters may experience burn marks that are not removable. 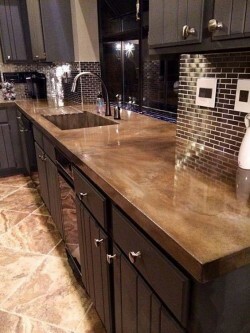 Even on certain material, the surface could rise, making your countertops look awful and unkempt. Porcelain tile is a perfect replacement option. If you are looking to have a hardwood counter Happy Floors offer several selections of porcelain tile that look like exotic hardwood. Out of style. Those countertops might have been a trend a few years ago, but now they are completely last season. Perhaps you may want to keep up with the Jones’s and change up the countertops to the latest trends. While many don’t find the value in staying in style, some may have to. This will be an extreme reality for those that are considering selling their home. Kitchens are always an amazing selling point, even if the rest of the home may not be worth the purchase. A home may not sell for much or as fast if it has an outdated kitchen. A solid slab of marble may cost you a fortune but for a fraction of the cost you can use a marble tile for the same look and feel. Use Cosa Marble to design a show stopping countertop that will bring you back to the kitchen. Renovation is in order. Contrary to selling, if you are keeping your home and simply want to update your kitchen with a small kitchen renovation, it is definitely necessary to look into knew countertops. This is especially true if you plan on changing the entire layout of your kitchen. With the new layout, the current countertops in place may not align. Cutting, adjusting and reshaping countertops might not work to your advantage. If a cut is done wrong, there is no replacing it. Additionally, if you plan on changing the type of cabinets to install, the older countertops may not match, typically because it’s very outdated. It is easier to start completely new rather than having to refurbish and restyle the existing countertops. If you are looking for something unique Metaphor Bronze Tileworks will give you what you are looking for.